BIO ~ Argo is a neutered male mid-content wolf-dog which means he looks and acts roughly half-dog, half-wolf. He was born in 2006 and came to WSWS in October of 2010. PERSONALITY ~ Our handsome Argo is a very vibrant boy with a very naughty streak. One of his favorite pastimes is to sneak up behind his caretakers and deliver a playful bite on his or her rear end. His caretakers usually find this much less fun than he does! RELATIONSHIP ~ Argo lives with high-content wolf-dog, Cheyenne. They often display normal dominance rituals but get along well. You can visit this playful couple on our tour path. LIKES ~ Argo loves breakfast delivery, med-ball delivery, or delivery of anything resembling food. He does a happy run in a big loop until breakfast arrives. He also loves chasing ravens and fence fighting with Cinder and Riot. DISLIKES ~ Although he loves the meat we use for med-balls, Argo hates when we try to give him supplements or medications of any kind. He’s got a real knack for knowing when something is hidden inside these treats and will eat everything except the part he needs. FUN FACTS ~ Argo has very unusual and stunning eyes. 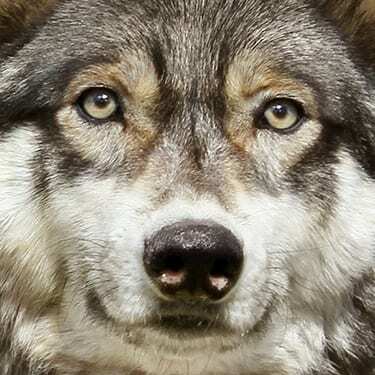 They are a very light yellow and have a lot of gray, which is rare in wolves. He also has markings on his face that look like he’s wearing glasses. WISH LIST ~ As Argo becomes one of our seniors, we would love to give him the joint supplements featured on our AmazonSmile Wish List. Argo is Still Looking for Sponsors! ARGO’S HISTORY ~ Argo originally lived in Minnesota with his owner and four other canines. 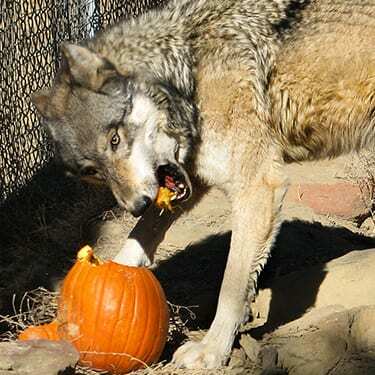 His owner wanted to downsize her “wolf” population, and since he was the least social of the group and had nipping tendencies, she asked if we could take him. 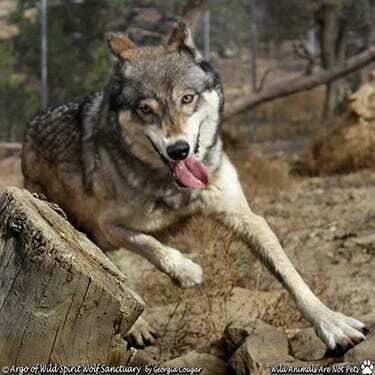 We were looking for a male companion for one of our lone females, Cheyenne. We worried about his future as a high-maintenance wolf-dog that sounded like too much for anyone to take care of. We agreed to accept Argo and drove to Minnesota. We were lucky to be able to contain him in the owner’s barn and anesthetize him easily. He has adjusted well to his life at Wild Spirit. He is still shy and never lost his nipping tendencies. He is doing wonderfully with his habitat mate, Cheyenne.